give a fig | A new veg in town? A new veg in town? It’s time for a little veggie check-in. 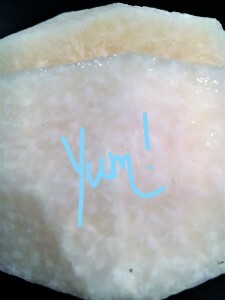 I thought I’d spotlight this big, yellowish-brown brute of a root vegetable: the jicama (pronounced hick – a – mah). 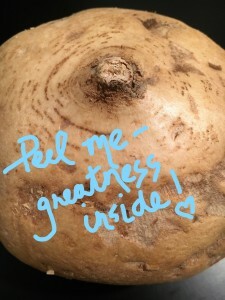 While the jicama may be far from a beauty pageant contender, it happily makes up for its lack of looks on both the taste and nutrition scale. (And the weight scale…it’s got some mighty heft!) Originating from the Mexican peninsula, the jicama is often called a ‘Mexican turnip’ or ‘Yam Bean.’ It closely resembles a turnip, and tastes like a cross between a water chestnut and an apple. The flesh is white, crispy, juicy and slightly sweet. When eaten out of hand, this tuber is a snacker’s delight! What are the health benefits of the jicama? Now. Let’s talk fiber. The jicama provides prebiotic fiber – a special type of indigestible fiber (inulin) that ferments in the gut. Inulin acts as a prebiotic, meaning that it helps the good bacteria in your gut (your probiotic bacteria) do their job best. This wonderful action positively stimulates the immune system, improves digestion, and helps with stabilizing blood sugar. Inulin also supports bone health by enhancing mineral retention and helping with calcium absorption. So, how do we eat jicama? Look for jicamas that are firm to the touch (no soft spots), with no specks of white mold. Bring veg variety into your life – try this one on for size!